When Steph and Gary first entered our tasting space, I knew they were going to be amazing to work with. Open, playful, fun, lovers of sweets, and an exacting sense of style that would allow me to engineer something truly one-of-a-kind for them. 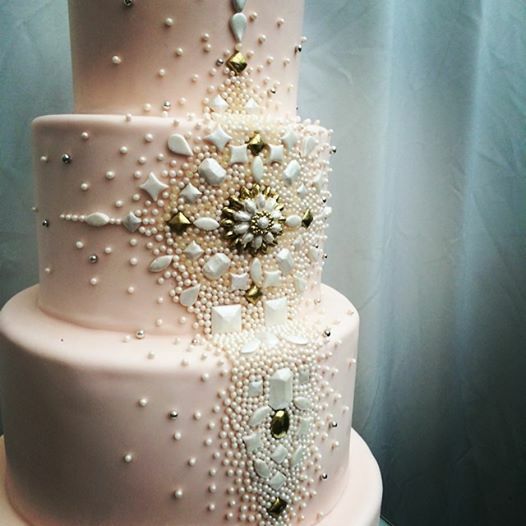 The bride wanted bold sugar jewel work. A burst or bursts of some sort that incorporated pearls, metallic gold and silver. A theme that would run through her natural blush palette, accented with gold stars. After several design sketches and a practice cake, we came up with this final design to feed 100. The central brooch and each jewel were molded from sugar using various molds and left to dry for several days. 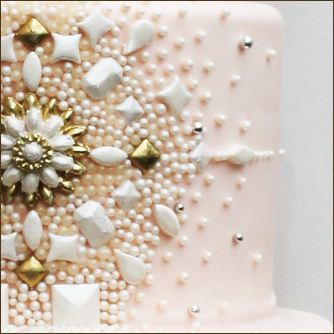 Once dry, we were able to mix a little vodka with edible pearl dusts and real gold and silver on the jewels. Once dry and applied to the cake, they are dry-dusted for extra shimmer. I love bold mathematical designs that leverage a little natural flow, so we used a mixture of sugar pearl sizes and colors to acheive some mixed up fun in this orderly design. A firework or exploding star is a little chaotic, right? Why shouldn’t this one have a little natural interest too? To keep the cake from looking too common, we tinted the fondant the palest shade of blush we could acheive. If you know your sugar’s behavior, you know that pinks fade fast — like overnight-fast. So we actually started with a shade deeper than the one you see, knowing it would fade to the perfect gentle shade of rose on the Big Day. Blacks and purples are also notoriously finicky — black and gray fondant can fade to purple or lavender, and purple or lavender fondant morph into *blue* under the right circumstances (heat and moisture). 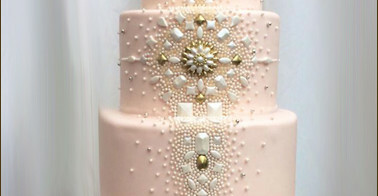 You can imagine how long this took — hours and hours of piping tiny dots and applying the jewels and pearls with dental tweezers. 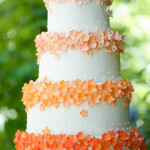 But I often find that the most challenging cakes turn out the best because it ups your game. Makes you focus on getting every level and jewel placed just right to make the overall look cohesive. Thank you Gary and Steph for letting us be a part of your Big Day and congratulations! !